Eco-Fi Street fuel injectors are performance replacement injectors offered as economic and budget friendly, basic upgrades to your vehicle's fuel system. Each EV14 injector is flowed and matched and are strictly intended for naturally aspirated and mild, forced induction street tunes. All Eco-Fi Street injectors include Viton O-rings and, where applicable, height adapter tops. 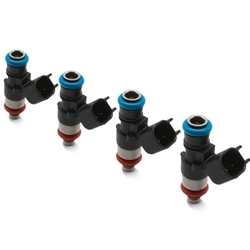 Eco-Fi Street injectors are available in single-piece or sets and come with EV14 pigtails. This specific injector size (38mm) is only available in 1,000cc and is sold in a pack of (8).